The last time I took an in-depth review of my needs regarding managing tasks and projects was almost two years ago. My conclusion was that OmniFocus both fit my needs and was the most enjoyable option to use. So much so that when Stephen & Shawn asked me to write about “GTD apps” for The Sweet Setup, it was more an exercise of reviewing the capabilities of each option rather than having to choose a winner. And that’s how it’s been for 2 years. Until Sven. Over the past few months, I’ve seen Ben Brooks write about 2Do, some new kid on the Mac personal productivity block. And Ben mentioned that he gave it a look when Federico touted its features. But it wasn’t until I saw Sven give it a test run that I was sucked into giving 2Do a look. Testing a new task management tool is usually more trouble than it’s worth. Moving tasks around is usually less useful than actually doing them! But I had just finished up Deep Work, What’s Best Next, and The Focus Course. I was going through the exercise of evaluating how I work and what I’m working on in all areas of my life. Taking a high level view, identifying my purpose, and listing my roles and responsibilities turned out to be a great chance to put all the small steps in place. Even in a different tool. After 2 weeks of trialling the mobile and desktop app, I was sold. What makes this app so good? First, it’s a joy to look at. The interface is clean and well designed; specific functionality of the application is hidden until needed. As for the feature set, it as just as robust as OmniFocus. But the beauty of 2Do is that it combines the best of both worlds. It’s as functional as OmniFocus, but presents that functionality in a more enjoyable manner, more like Things. But where Things ends in what you can do with it, 2Do delivers all the customization you need. I’ll use the organization of your tasks as a good example. In OmniFocus, you can add projects and folders. Now, most of us have many roles to play and have tasks related to each. Many OmniFocus users break their “Areas of Responsibility” into folders at the base of their system. You can then add projects under each of these folders. It also allows you to create “single action lists”, which represent those areas where you have things to do with no end date (whereas projects are intended to have an end date). In contrast, 2Do allows you to create lists and groups to organize the areas of your life. In your lists, you can then add projects and checklists. Both of these can contain tasks. And you can break this down further to include sub-tasks. At the heart of any task management tool lies how the app will allow you to categorize your core responsibilities. It truly is the flexibility that makes 2Do compare so well to the other options. While most of the big players in the personal task management space for OS X are high quality, there are a couple of aspects of 2Do that drew me in. First, the organizational baseline of 2Do was closer to Things than OmniFocus. Things was the first app I used in this category as a Mac user; it was part of what drew me to the platform. 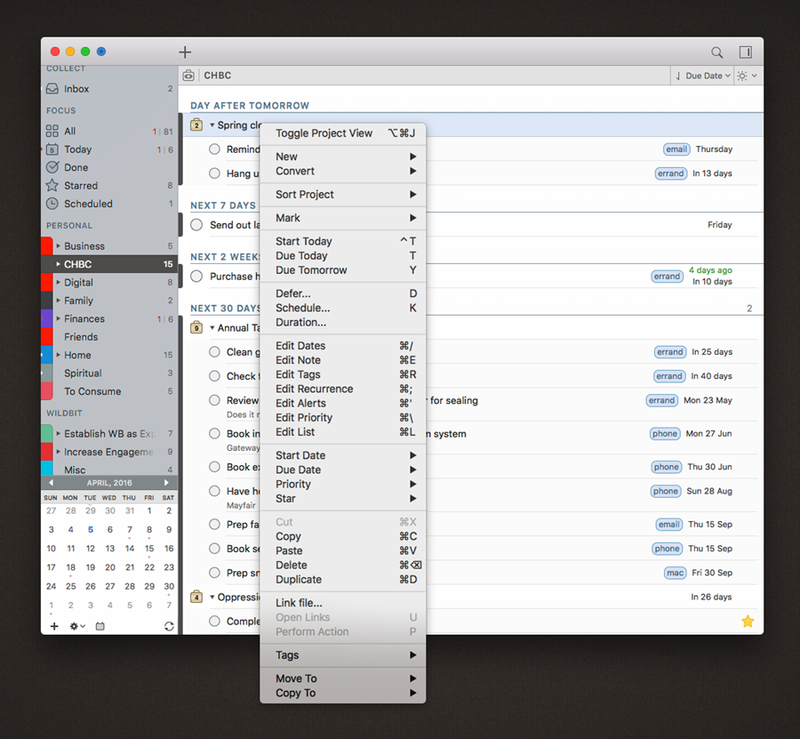 But where Things was rigid in its organization, OmniFocus allowed a little more fluidity. It enabled me to create custom views that fit my work days or contexts (common situations) better. However, 2Do takes that customization to another level. 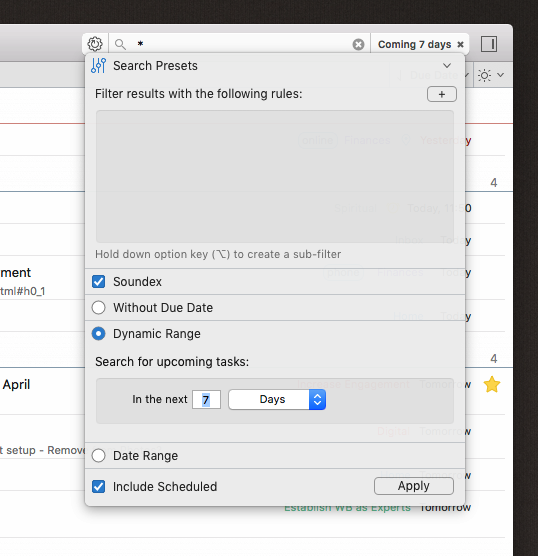 Where OmniFocus allows you to create Perspectives based on limited options, 2Do’s smart lists are far more flexible and enabling. Where OmniFocus is rigid in terms of where a task can be assigned and located, 2Do adds a lovely method for storing tasks. Let me give a concrete example. Since everything in 2Do is a list, when you're adding a new task, it can go under one of your main lists. But that list can also contain projects and checklists. Your new task can sit on its own under the parent list, or you can easily add it to any included project or checklist. Sounds obvious, right? But this is something that is not possible in OmniFocus … new tasks must be included in an existing project under a parent folder. At the same time, 2Do is nicer to look at than OmniFocus. I sure appreciate the work of the folks at OmniGroup, but their apps are not the most pleasing visually. There are no theming options with 2Do, but the UI is already very nice and customization comes with the colour of your lists and the size of the font. 2Do is very thoughtfully designed. The layout of the information allows for differing densities, and even with all the details in view, there is never a sense of being overwhelmed. This is an especially nice touch on iOS. One of the most powerful aspects of 2Do is the search. You can identify any criteria to create a custom view of what you want to see. Once you have created this view, you can save it as a smart list. This is essentially the same as custom perspectives in OmniFocus. But there is a little more possibility and control here. There are a few other items that have gotten my attention over the weeks of using 2Do. One is the amazing keyboard support. Everything in the app can be done via the keyboard. The list of shortcut options is lengthy! Another nice touch is the prioritization of tasks. You can set any task, project, or checklist to have one of five levels of priority. The default is none, the lowest level of priority. The highest is a star. It’s just one more way to allow you to mark and view tasks in ways that make sense to you. Last is the support for tags. The ability to use tags in 2Do is much like any other application. 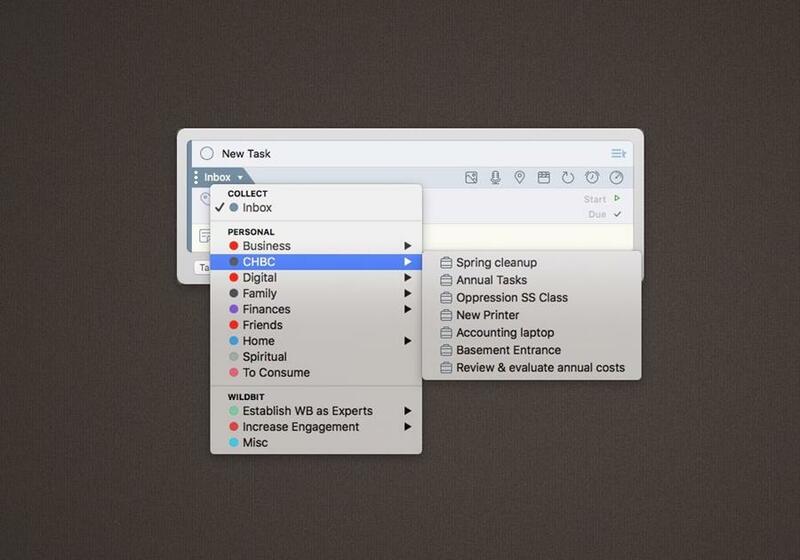 But in a task management app, this allows you do view tasks across lists. So for GTD lovers, tags can be your contexts. Is there room for improvement? Of course. For one, syncing over Dropbox is a tad slow. There does not seem to be any option for background syncing like OmniFocus has. As well, some keyboard actions are counterintuitive and take time to become accustomed to. There’s a world of difference between having choices and have to make choices. Indeed. 2Do strikes the right balance. Would I advocate moving to this tool? Only if you have a good opportunity to do so and a need for change. OmniFocus, Things, and all the other options are great tools. Hey, pen & paper are a lovely option as well! But if the opportunity presents itself, give 2Do a look.